Similar to other courses, CI 104 is case-study driven. Within each case study, you will encounter a key investor decision: Should a non-taxable investor acquire an investment with or without debt financing? What if the investor is taxable? During the holding period of an investment, should an investor make a discretionary capital expenditure or not? How does an investor evaluate disposition alternatives? Gain knowledge, tools, and resources needed to make these decisions. Begin to develop the practice of integrating the CCIM Communications/Negotiations Model into all real estate decisions with a focus on using this Model in presentations. With today’s challenging real estate market, we will also take a comprehensive look into approaching risk analysis by exploring the types of risk associated with real estate investment, and the ways to mitigate and manage those risks. Apply key investor decision-making analyses to optimize investment returns. More effectively forecast investment performance by quantifying real estate risk. Leverage CCIM analytical tools to improve decision-making. Ms. Carmela Ma, CCIM, CIPS, CRE, FRICS was awarded 2009 Women at the Top by Commercial Real Estate Women CREW, 2008 as one of the World Top 10 Broker by Real Estate Global Summit and 2007 one of the Most Influential Women in Commercial Real Estate by Real Estate Southern California Magazine. On education, she was awarded the CCIM Instructor of the Year 2003, a once in a lifetime award by the CCIM Institute, a most prestigious international commercial real estate organization. In addition, The CCIM People™s Choice Award 2003, and 2006; Senior Instructor of the Year for Financial Analysis in Commercial Real Estate CI-101 2001; and the International Instructor of the Year 1998, another once in a lifetime award CIPS, conferred by NAR®. A scholarship endowment was awarded in her name for the CCIM Greater Los Angeles Chapter in perpetuity. Ms. Ma is President of CJM Associates, Inc., a California based company specializing in Real Estate Investment Brokerage, Advisory and Global Transactions. She has been involved in international real estate since the 1970s. She is an American Citizen with years of management experience in the USA and offshore. Her projects have taken her on business trips worldwide (over 30 countries) and produced and hosted her own weekly radio program on city planning, development and design. She was a publisher and an international speaker in numerous cities in USA, Europe, the Americas, and Asia. Her transactions include industrial developments in Africa and Asia, estates from Italy to Beverly Hills and investment properties in Hong Kong and California. She has counseled clients on acquisition, disposition, strategic planning, broker selection, risk reduction, portfolio analysis and value enhancement. In addition, she has marketed properties ranging from high-rise office buildings, multi-family, land, industrial, shopping centers, hotels and R & D properties. Ms. Ma is a licensed real estate broker and consultant. Her clients include major Financial Institutions and Trusts. She studied Business Finance at the University of Southern California, and Architecture at the University of Hong Kong. She is an international speaker with speaking assignments covering Asia, Europe and the Americas. She was invited to become a member of the CRE and is a Fellow Member of the RICS. Ms. Ma is a senior instructor of the Commercial Investment Real Estate Institute, the institute that confers the member designation (CCIM), a designation known as the Ph.D. of Commercial Real Estate. She is also an international instructor for the NAR international division, which confers the CIPS designation. Ms. Ma served as the faculty chair/dean of the NAR International Section, president and founding member of the CCIM Chapter of Greater Los Angeles, and Chair of the CCIM International Coordinating Committee. She also served as the Education Steering Committee Chair, 2005 Chair of the International Operations Committee, Board of Director for the CCIM Institute and President™s Liaison International of the NAR, the largest trade organization in the world with 1,300,000 members. 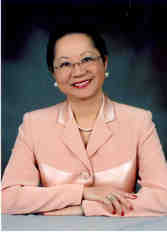 She also served as the co-chair of the AREAA International Conference 2007. Carmela has extensive international business experience that began in the early 1970's. Her projects and meetings have taken her throughout Europe, Asia, the Middle East, Africa, Pacific Rim countries, Canada, and the US.